Sylvia Plath once said, ‘There must be quite a few things that a hot bath won’t cure, but I don’t know many of them.’ This rings true to anyone who just wants to go home after a long day of defeating life expectation and trying to rise above the occasion but failing. A bath is like a rebirth; intend to wash away the stress and dirt weighing down your soul. However, the thing with having small, cramped bathroom is this – it makes anyone feel trapped. Instead of feeling relax, small spaces have the tendency to create a suffocating atmosphere. Not all of us can afford the ideal Carrie Bradshaw New York apartment with its lit decor and bathroom floor that we can probably camp away our worries. What most of us have is that kind of bathroom that has barely enough room for another scented candle. The Internet is a wonderful place that gift people ideas on what to do with that kind of bathroom.If you are planning to transform your bathroom, follow Chesters’ tagline: Simply… BATHROOMS. Our hair dryer can be in the way, so why not create a holster to keep it in one place? Cut the pipe in a Y shape using the pipe cutter. Decorate it to your own personal taste. For a pin up vibe decoration, just paint the pipe with any basic colors that you like and add little dots to it. Just a little reminder: before purchasing or selecting the pipe or starting the project altogether, measure the inside diameter of the pipe. Although a standard PVC pipe is big enough to store your hairdryer halfway, it is also important to make sure it fits. Store everything with this strip holder, from scissor to your tweezers. This holder helps protect the sharpness of the tools and also maintain its fine edges. You can buy a long magnetic strip at any fancy kitchen stores that you know or even inexpensive ones available at IKEA. Step 1: Place the magnetic strip to any sturdy flat material that you have. These could be a long rectangular wood or a hardwood lying around. Step 2: You can use a double sided tape or just glue them together instead. You can use Elmer’s Carpenter’s Wood Glue or any other wood glue to stick the magnetic strip on your cabinet. Fact-check: Most small bathroom doesn’t have enough storage spaces. To make it more spacious, you can make this simple DIY Towel Rack Holder. Use your current towel rack and attach a basket to the rack. This could be done by looping a ribbon through the basket and tie it around. For a sturdier finish, you can also use those S-hooks available at hardware store. Mason jars are here to stay. Not only are they useful in storing knick-knacks and snacks, but they can be used as a wall organizer too. Now you can save up enough space without giving up any items found in your bathroom. For this project, you’ll be using the hose clamps. Just ask someone at your local home improvement store and find the size that will fit in your mason jar. First, paint your wood. You can use a staining wood for that rustic feel and let it dry. This is an optional step. Wait for the paint to dry. Afterwards, use a power drill to create a hole in the wood. Line up the hose clamp and screw it into the wood. Repeat these steps until all of the hose clamps are attached. This will be used to put your mason jars in place. Afterwards, hang the mason jars and fill it up to your heart’s content. Wouldn’t it be nice to take a picture of ‘Instagrammable’ #ootd in front of a full-length mirror? Sadly, full-length mirrors occupy too much space! But with this guide, we can turn that space hoarder into a space saving spot! Start by building the mirror door. The specs will be based on the mirror you’ll be using. You can check Home Depot for a $25 full-length mirror. Then, take some measurements and build a cabinet where you can attach the mirror as its door. You can use leftover wood, given that you know its characteristics or if it’s safe and recommended to use in a humid environment such as the bathroom. Safety first! Build your way into creating a hidden cabinet behind that full-length mirror to save up space. Behind the mirror, you can keep some of your makeup and accessories, or even your stock of toiletries like shampoos, soaps, shaving cream, etc. 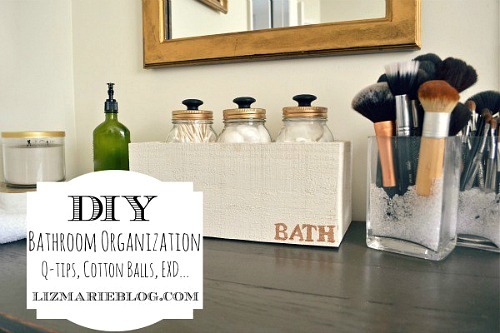 It will declutter your bathroom and you can easily find everything as you organize your things behind the mirror. Now, you won’t forget that you still have some leftover shaving cream or waxing strips that you need to consume! DIY projects like this can go a long way in transforming something you dread using to something that can be your own personal space. Bathrooms are important, not only are they used for our hygiene purposes but also can be a place for tranquility. A clean and organize bathroom not only helps with extra storage, but also creates an atmosphere to relax and end the day feeling fresh and clean.